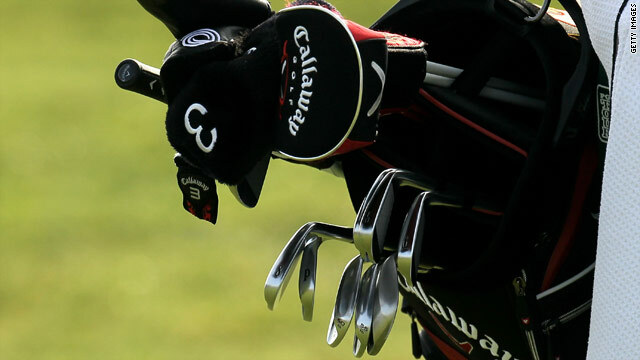 A close up view of Mickelson's bag including the wedge which has sparked a row. (CNN) -- Phil Mickelson carded a five-under 67 to move into contention in the Farmers Insurance Open at Torrey Pines then mounted a stout defense against accusations he is "cheating" by using a 20-year-old wedge. World number two Mickelson has opened his 2010 PGA Tour campaign with a Ping i2 wedge in his bag, taking advantage of a loophole in equipment regulations introduced on January 1 by golf's rulemakers the United States Golf Association and the Royal & Ancient.Golf Club. His club has the grooves which are banned in the United States, but a lawsuit dating back to the early 1990s, filed by Ping, has led to their particular brand of wedges made before 1990 to be allowed for play on the PGA Tour this season. Mickelson is one of a handful of players who have opted to have the club in their bag and fellow professional Scott McCarron made his feelings crystal clear in a published article in the San Francisco Chronicle on Friday. "It's cheating, and I'm appalled Phil has put it in play," McCarron was quoted in in the newspaper. The comments have added weight because McCarron, who missed the cut at Torrey Pines, is a member of the PGA Tour Players' Committee. After completing his second round, which left him four adrift of joint halfway leaders Ryuji Imada of Japan and D.A Points, Mickelson admitted he was exploiting a loophole. "I agree that it's a terrible rule," Mickelson told reporters. "To change something that has this kind of loophole is nuts. But it's not up to me or any other player to interpret what the rule is or the spirit of the rule." "I don't agree with the way he (McCarron) carried on about it, but that's his choice. "All my clubs are approved for play, and I take that very seriously not to violate any rule. It's not my job or the job of any of the players to try to interpret the spirit of the rule or the intent. "I understand approved or not approved. I didn't make this rule. I don't agree with the rule, but I'm abiding by it." Earlier Mickelson made his move on the easier North Course at Torrey Pines, having opened with a 70 on the tougher South. Imada and Points are on 11-under 132, but a clutch of players remain in close contention ahead of the final two rounds. They were two strokes ahead of Matt Every, who had a 70 on the South, and Michael Sim of Australia, who had a tournament-best 62 on the North Course, rounded off by an eagle. Australian Robert Allenby, who opened with a 67 on the South, was two shots worse in his second round on the North to be three shots back going into the weekend.